The original series started broadcasting on February 4, 2007 and ended on January 27, 2008 in Japan. Nozomi Yumehara, a regular student, finds a magical book called the Dream Collet in the library and meets Coco, a creature from the Palmier Kingdom. Nozomi decides to help restore his world, which has been destroyed by an organization called Nightmare, by completing the Dream Collet and finding the 55 Pinkies to make any wish come true. By making her decision to help Coco, she proves she has the heart to be a Pretty Cure and is given her Pinky Catch from a pink butterfly letting her transform into Cure Dream. Meanwhile, the Nightmares are fighting the cures to steal the Dream Collet and defeat Pretty Cure. To help, she must choose a team of four other students to be Pretty Cure so that she may help protect the Dream Collet and save Nuts from his entrapment within. 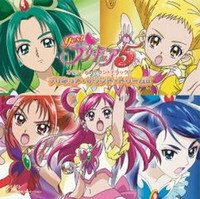 Together with Cure Rouge, Cure Lemonade, Cure Mint and Cure Aqua, they form the Pretty Cure Team. The movie Kagami no Kuni no Miracle Daibōken! (鏡の国のミラクル大冒険 lit. Great Miraculous Adventure in the Mirror Kingdom) premiered on 10 November, 2007. While Nozomi and her friends are enjoying themselves at Princess Land, an amusement park, Coco and Nuts have been abducted into the Mirror Kingdom. At the same time, Shadow (Voiced by: Romi Park) is after the Dream Collet so that he can use the power of the Pinkies to rule the Mirror Kingdom. To prevent this from happening, Migirin and Hidarin, who are residents of the Mirror Kingdom, become allies with Pretty Cure to assist in the fight against Shadow and rescuing Coco and Nuts. The sequel Yes! PreCure 5 GoGo! started its run on February 3, 2008. A new Pretty Cure warrior is introduced. The Cure Rose Garden has always been concealed from human eye. Flora, the area's guardian, watches over it and ensures that the path to the secret area doesn't appear. However Eternal, an art organization known for amassing treasure and artwork from many worlds, is trying to get to the garden. To do this, they first invade the Palmier Kingdom and four other kingdoms. Flora senses the approaching danger and sends a letter to Nozomi and the Pretty Cure 5. Their new mission is to find the four rulers that have fled from their kingdoms since they hold the Rose Garden Keys.